1. The Gaffer - Will Austria do what the overwhelming majority of RBNY fans think it should do and hire Richie Williams as manager on a full-time basis? If the recent interviews with new Red Bull sporting director Dietmar Beiersdorfer are any indication, there is at least an understanding in the organization that having an experienced MLS man at the helm is probably a good thing. Almost without exception, European managers have struggled in MLS because of the unique constraints of the single-entity system. Williams' familiarity with the organization and his understanding of the league's structure and style should make him the top contender. Despite a few shaky results (RSL away, anyone? ), ABMOD proved that he has the ability to right a sinking ship. Whether he has what it takes over the course of a full season or more is open to discussion, of course, but it couldn't really get any worse, could it? The only other name in the discussion would have to be Preki, who looks certain to leave Chivas. But he may have his eyes on another job. 2. The DP - As the 2009 season wound down, the Thierry Henry discussion started to heat up again, abetted by comments from former Metrostar/Red Bull and France international Youri Djorkaeff. RBNY has the vacant DP slot and Henry is one of the few realistic international superstars who could put butts in seats at Red Bull Arena. How soon he could arrive if he were to sign with the club is another matter. Much will depend on France's World Cup fortunes, but TH14 seems to be on his way out of Barcelona sooner or later. The bigger question is, "Would Henry be a smart signing?" This is a club desperately crying out for goals, and one could envision the Henry/Angel partnership as a devastating one but the question remains, "Who will get them the ball?" If Henry is in the cards, a creative midfielder should also be on the RBNY shopping list, because nobody is going to light up the scoreboard relying on service from the likes of Seth Stammler, Luke Sassano and Jorge Rojas. 3. Who's Leaving Town? - It seems certain that a number of players from the 2009 squad will be either jettisoned, traded or lost in the expansion draft. First out of town should be Jorge Rojas, who had a terrible 2009 season after showing some fleeting glimpses of skill in 2008. The defense, which was just pipped by San Jose for most goals conceded conceded, requires major surgery. Shaky and injury riddled in the middle, the only positive to emerge from 2009 was the play of Jeremy Hall, who may actually be better suited to the left midfield role he played in college. Carlos Johnson showed some skill, crossing ability and quickness, but his red card/games played ratio was staggering. The underrated Danleigh Borman is a keeper, especially considering his salary. But can we really consider a club that starts Andrew Boyens and Kevin Goldthwaite in the center of defense a contender? Whether through the draft or via trade, a new center half or two will be needed. In goal, though neither Danny Cepero nor Bouna Condoul would be considered an elite MLS keeper, both are serviceable. Condoul demonstrated his athleticism at the end of the season with a string of fine saves against Toronto FC and would be my choice to start next season. With so many holes to fill elsewhere in the squad, it's unlikely that the powers that be will focus their efforts on goalkeeping. 4. 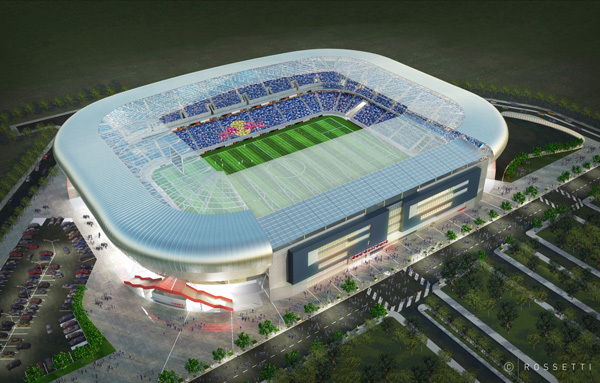 Will RBNY Finally Make a Dent in the NY/NJ Market? - This is the $100,000 question. Considering the massive investment Red Bull has made in the sparkling new Arena, one would assume that they will be doing everything in their power to sell the hell out of the team as they move into their new home. And yet the organization, going back to the Metrostars days, has found the New York sports market a tough nut to crack. Lame stunts, such as sending Red Bull brand reps out to run around Manhattan like idiots have done more harm than good. So what will it take? Well, a winning team in a beautiful facility, first and foremost. But this needs to be coupled with smart advertising and long-term outreach to the communities that care most about soccer in the area. It's easy to say that the Red Bulls should "be more like Seattle," but the two markets are nothing alike. Austria will need to do a better job of listening to and selling itself to the local market than it has to date. In a New York sports environment where single game seats can go for $1000 or more, you'd think that there would be a compelling economic argument to make, if nothing else. I've never been of the opinion that the Red Bull brand itself is a barrier to support. If the team is playing attractive soccer, the gameday experience is a positive one and there is a buzz about the club, fans will turn out. 5. The Draft and Youngsters - Like the investment in Red Bull Arena, it would be hard to fault Austria for its commitment to building a strong academy program. As other MLS clubs lag behind, the Red Bulls have produced a string of bright prospects that should come through to the senior squad over the next several years. Striker Georgi Chirgadze became the first academy player to be signed by Red Bull back in September. Only MLS' convoluted youth development rules prevented RNBY from adding Dilly Duka to its roster, a situation which is likely to be resolved if - as expected - the club select him as second overall pick in the upcoming MLS superdraft. As a result of the sale of Dominic Oduro to Houston, RBNY also have a second selection in the first round to play with this year. As MLS begins to come to terms with youth development and - hopefully - eases restrictions on academy signings, this is an area where RBNY could have a real advantage over clubs who have lagged behind. At the very least, it will be exciting to have hometown players to root for again, something that has been in short supply since Jozy Altidore departed for Europe. Of course the possible failure of the owners and players to arrive at a new collective bargaining agreement could come along and make all of these burning questions irrelevant, but for the sake of the league and the club, let's hope not! I expect a big name signing as well. Maybe not Thierry Henry (though Djorkaeff's comments certainly are telling) but somebody to help fill the new stadium. As for who leaves, I think the easier question would be who stays. Right now I simply don't see anybody, even Juan Pablo Angel, as a sure thing. Tell you one thing though: I can't WAIT for the new stadium. All of them are - or could be - out of a job very soon. But are any of them better choices than Williams? I'm not so sure. I wonder if they might appoint one of these guys as Director of Football instead.